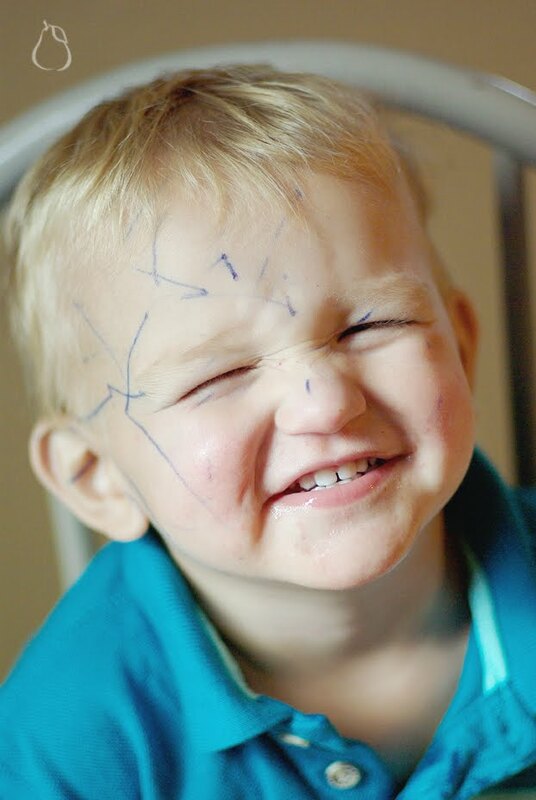 I guess drawing all over yourself is a necessary part of growing up. I would have to imagine that every kid has tried it. My dad teaches high school and he says his teenage students enjoy it as well. Weird. Must be fun though, look at that face. I just found Dennis with a huge crusty ring of chocolate around his mouth. I asked him what he had been eating while being extremely and utterly quiet downstairs for a good half hour. He promptly replied with " I wasn't eating hot chocolate". Hmmmmm. If that's not a tip off, I don't know what is. He hurried to explain how he had some gum (pink Bubbalicious to be exact) and how he doesn't know how, but chocolate just starting coming out of it. Riiiiiight. Logical. That makes perfect and complete sense. Pink bubblegum with enough exploding chocolate in the middle to cover the entire bottom half of your face. Uh huh. Anyway...he's currently in the process of cleaning up the hot chocolate from inside the pantry. Where does he come up with these wild stories? Please document in writing and pictures the next time you are feeling blue. If the therapy works I shall try it. I think maybe Dennis has watched Willy Wanka to many times. Such a cute story! 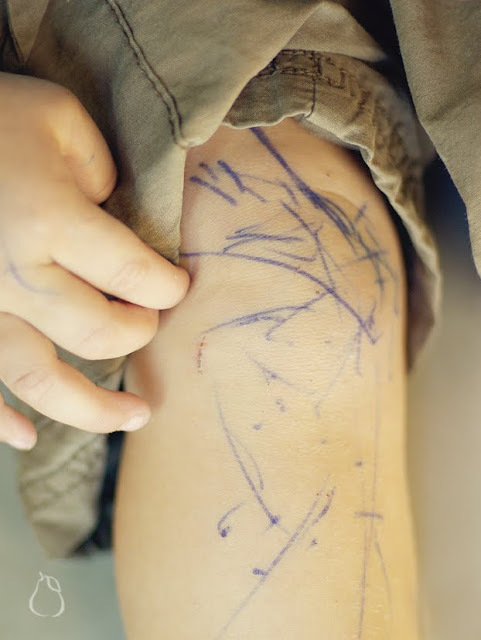 Alli has started drawing all over herself and it drives me BONKERS especially when we show up at church and I glance over and see her hands all tagged up like she hasnt showered in weeks, which I guess may be true. Also I would LOVE some exploding chocolate gum I might GaG on it...blah. But Dennis has quite the invention on that idea.